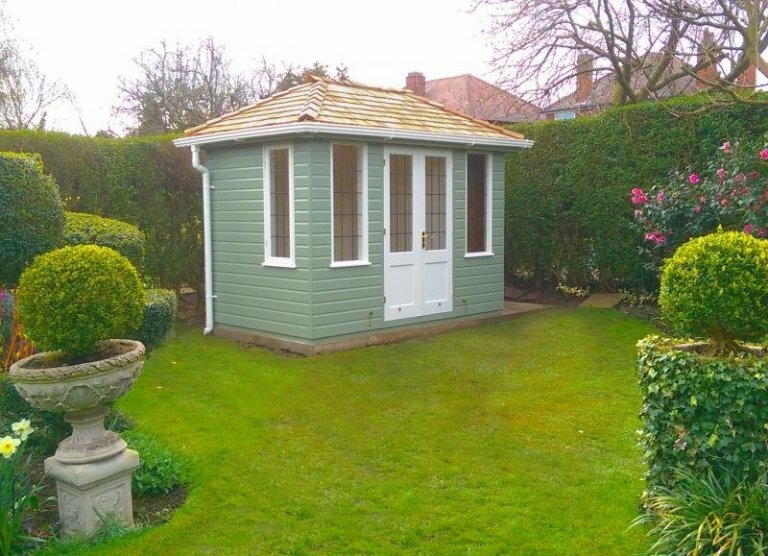 This quaint, 1.8 x 3.0m Cley Summerhouse has been installed in our customer’s garden in West Bridgford, Nottinghamshire to be used as both a little garden retreat and a storage area, which has been achieved through the addition of a partition. The Cley has got double doors in the front side, with a single window on both sides of the doors. There is also, normally, an opening window on both gable ends, but because of the partition in this Cley, there is only one on the left-hand side. The partition has been placed to the right of the doors, creating an insulated space of 1.8 x 2.10m, and an uninsulated space of 1.8 x 0.90m. This uninsulated space has got a single, solid studio door on the right gable end to gain entry. The colours they have chosen fit in very well with their garden, with cedar shingle tiles on the roof that will silver as they age, the guttering is white, and the summerhouse has been painted in two different colours: the windows and doors have been painted in Valtti Ivory, and the rest has been painted in Valtti Lizard. These are two of the 15 colours that can be chosen from the Valtti colour range. 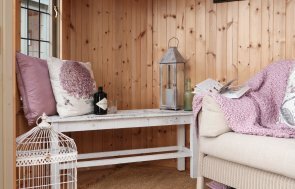 Internally, the customer has got painted matchboard lining on the walls, insulation in the walls and ceiling and a Light Oak lacquer on the floor in the main section of the summerhouse. In the storage section, these features have been removed, as the customer felt that they are not necessary to its purpose. 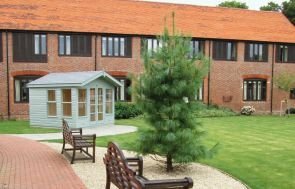 If you are interested in having a Summerhouse in your garden, you can go through our step-by-step process to create your own by using our Online Garden Building Planner Tool, or, if you have any questions you would like to clear up first, you can either Contact Us online or call us on 01760 444229 and our helpful team will answer these for you.